Enjoy a swim with the Melbourne skyline setting a dramatic backdrop. 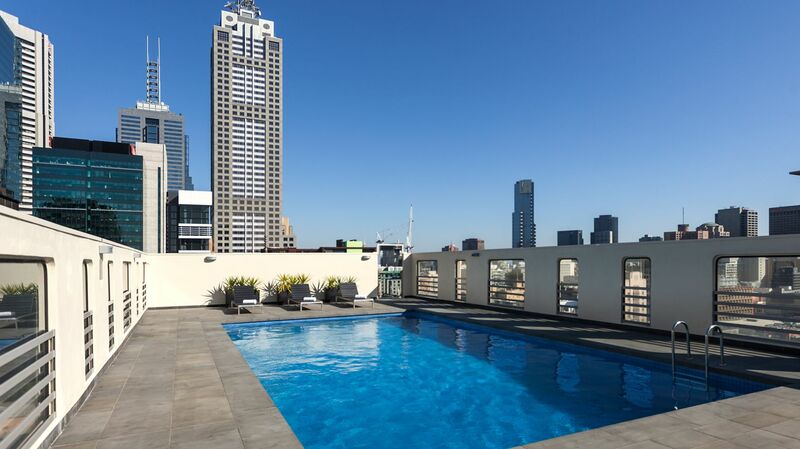 A beautiful rooftop swimming pool, heated to perfection, is a great place to relax and unwind on business trips and holidays in Melbourne. The Hotel Grand Chancellor features a fitness room on level 17 available for guest use, featuring Life Fitness cardio equipment including treadmill, cross trainer and bike. A multi-purpose strength machine and a range of hand weights are also available for use. Find true comfort at Hotel Grand Chancellor Melbourne, where 4-star amenities and boutique-style service set the stage for an exceptional experience. Handle any last minute business concerns in our Business Centre. Located on the first floor, the Business Centre features a computer and printer. Internet access, photocopying and faxing are available (charges apply).